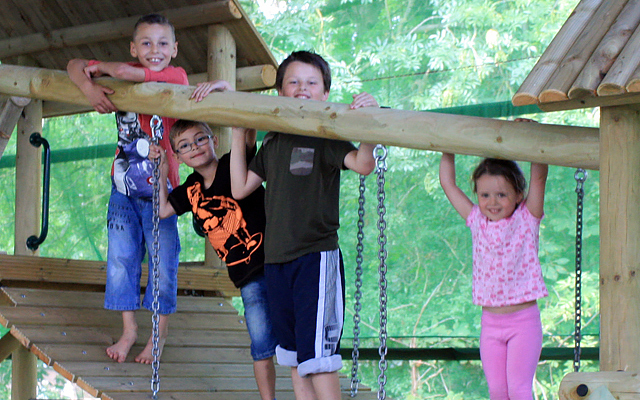 Climb up the scramble net, run across the scatter bridge, slide down the fireman’s pole and take on the climbing wall at Wild Place Project’s Fun Fort! The Fun Fort is a fun outdoor kid’s adventure park. It’s completely free and undercover making it a great place for the little ones to burn some energy come rain or shine! The Fun Fort is also home to our Wild Birthday Parties. Across Wild Place Project you'll find lots of Play Wild areas including the Predator Preyground, Congo Bongo and the Barefoot Trail. Go back in time with our life-sized wooden aeroplane model. The plane is based on the Royal Air Force's Bristol Bulldog model, which was first produced by the Bristol Aeroplane Company in 1927. The White family, who owned the aerospace manufacturer, also owned the Wild Place Project estate before they gifted it to Bristol Zoological Society. This model aeroplane was built to commemorate our history.